The Commonwealth has committed $2.3 million per year in WA for the PHNs to commission new psychosocial support services. The Commonwealth further committed $109 million nationally over 3 years from 1 July 2019 for the provision of Continuity of Support services to participants of current Commonwealth funded psychosocial services for people with severe mental illness who are found to be ineligible for support through the National Disability Insurance Scheme (NDIS). 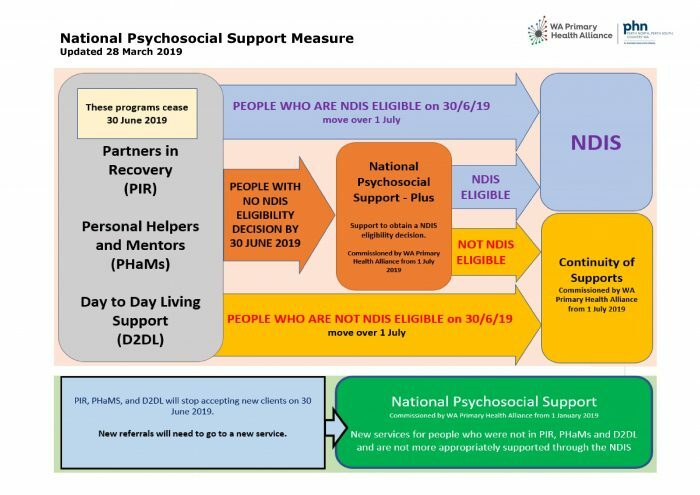 Psychosocial support services are being commissioned for people with severe mental illness through a new initiative called the National Psychosocial Support (NPS) measure. The services are for people who are not more appropriately supported through the NDIS. Interim services will be in place from January 2019 which will allow people with severe mental illness to receive support following the expected closure of referrals to existing psychosocial support programs. A primary focus of the interim services will be to help progress the several hundred reported referrals of people with severe mental illness who are currently on wait lists for the existing Commonwealth psychosocial support programs in WA. During February, WA Primary Health Alliance will be conducting mental health consumer and carer focus groups to identify the service outcomes that people with severe mental illness would like to be achieved through psychosocial support services from 1 July 2019. Once the outcomes to be achieved are known WA Primary Health Alliance will proceed with commissioning activities for services to be delivered by providers from 1 July 2019.